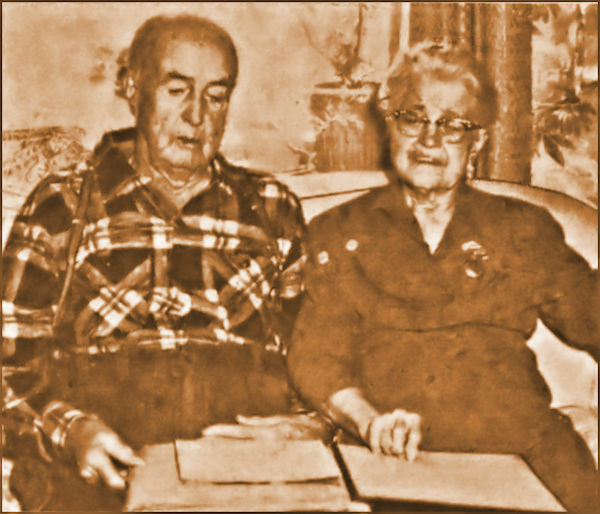 In 1960 Mr. and Mrs. Albert Jones, Provo residents, look over scrapbooks of their long life together. They attended Brigham Young Academy in the late 1880s, early 1890s, when there were only seven faculty members and a few dozen students in the school. On Tuesday, February 2, 1960, Universe Feature Editor Chris Allred wrote about a Cougar basketball fan couple who attended Brigham Young Academy and the Church Normal School when Karl G. Maeser was teaching. Within the article, the couple talks about their time at school and how the campus has changed since the late 1800s. “We still go to every basketball game, never miss one,” said two of Brigham Young University’s oldest living graduates and loyal fans. Albert Jones, 89, and his wife Sarah, 86, are given a season ticket to all Y games by their children each year. During the Jones’ school years, the school was called the Brigham Young Academy and the Church Normal School. Mrs. Jones explained that “Normal” was a term describing a two-year course designed to educate teachers. After graduation the teacher was placed in one of the district schools. All plays, activities and dances were held in the upper story. Besides President Maeser, there were seven other faculty members, he recalled. Mr. Jones relates that the school day would begin with a song and prayer, then theology and following that the regular classes. “We didn’t have any 'high schools' then. The Academy taught grades from the ‘Fifth Primer’ to graduation," he said. [Note: Prior to 1891, graduation came after completion of the 10th grade, that is, after two years of high school]. In the next few years, he said, school was held in the Old Provo Tabernacle and ZCMI warehouse. In 1892, when the Academy, with Benjamin Cluff at the head, moved to the present site of the Lower Campus, it was some blocks outside the town. “You have a beautiful campus on the hill, now,” put in Mrs. Jones. He served a mission for the Church in the Tonga Islands and has presented a rare Tongan Bible and a Tongan-English dictionary to the BYU Library. He has also presented the University with a bust of Brigham Young. Mr. and Mrs. Jones were married in 1897 and have celebrated 62 anniversaries. They have four children, 13 grandchildren and 23 great-grandchildren, many of whom have attended BYU. The article in its original paper layout can be found here. Albert Stephen Jones was born on January 15, 1871 in Provo, Utah, to Samuel Stephen Jones and Julia Bodilstine Ipson. Albert's father was a prominent pioneer, Church leader, and businessman in Provo,who served a term as Provo Mayor. At the age of eight Albert was baptized into the Church of Jesus Christ of Latter-day Saints. He received his primary education, then studied at the Brigham Young Academy under the tutelage of Dr. Karl G. Maeser. We are still trying to determine if he graduated from the Academy -- if so, it would have been circa BYA Class of 1889. Albert also learned how to succeed in business from his father, a successful entrepreneur, and for a time helped manage the family-owned charcoal kiln in Spanish Fork Canyon. On December 30, 1893 Albert received a call to serve a mission to the Samoan Islands. After a month's preparation he left his home in Provo and journeyed to Samoa, arriving on February 25, 1894. He remarked that “the island is a pretty place,” but three days later he was assigned to labor on the Tongan islands. The missionary work on Tonga was just beginning at this time. There were very few native members of the Church, and the missionaries struggled with both the language, and with government opposition. After a year of study and preparation, however, Albert and his companions began proselytizing in earnest among the native Tongans. Albert eventually succeeded in mastering the Tongan language and even wrote his own 200-page Tongan-English dictionary. However, very few natives accepted the teachings of the Church, preferring to remain part of the government-sponsored Tongan Free Church. Therefore, the decision was reached in December 1896 to close the Tongan Conference and either send the missionaries back to Samoa or release them to return home. Albert received his official release from the mission field and on December 24, 1896, Albert left Tonga and began his journey home to Provo. Immediately after returning from his mission, on May 12, 1897, Albert married Sarah Elizabeth Fletcher, also of Provo, with whom he had corresponded during his three-year absence. Albert married Sarah Fletcher, circa BYA Class of 1892, on May 12, 1897, in Salt Lake City, Utah. Albert was 26 and Sarah was 22. Her parents were Charles E. Fletcher and Elizabeth Miller Fletcher. Harvey Fletcher, BYH Class of 1904, scientist and "Father of Stereophonic Sound" was her brother. Albert and Sarah were blessed with four children over the course of their marriage, one son and three daughters. Albert made his living as a retail manager, specializing in dry goods and clothing. In the Church he served for several years in the Provo First Ward Sunday School superintendency, and later as a member of the bishopric of that ward for fifteen years. He also avidly supported the athletic programs of Brigham Young University, and hardly ever missed a home basketball game. Albert was blessed with a long, healthy life, and a large family, which included thirteen grandchildren and twenty-nine great-grandchildren. Albert Stephen Jones finally succumbed to the effects of old age on July 1, 1962 in Provo at the age of ninety-one. His wife, Sarah, died about four years later on April 11, 1966 in Orem, Utah. Both are buried in the Provo City Cemetery. Source. We currently do not have any record that Albert and Sarah graduated from BYA. We are actively researching Academy classes during those years, but they are among the most poorly documented years in the history of the school, due in part to the fire that burned the school during Albert's school days.